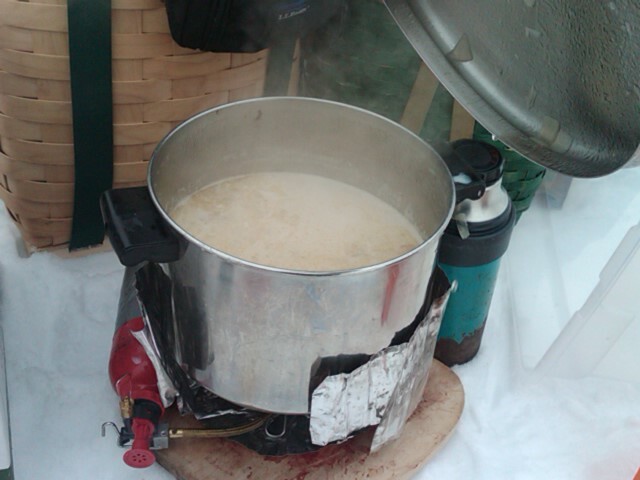 The trick with cooking any meal in the wilds is preparation. The more food tasks you can complete at home, the fewer you will have to carry out in less than optimal conditions and the higher your chances of success. 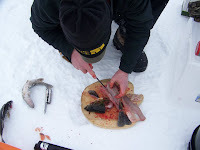 This is especially important ice fishing, when low temperatures, high winds and a variety of other factors can make fixing even a simple meal impossible. Below is a fun recipe that is easy and delicious on a freezing cold day. Add enough water to these ingredients, to just cover everything. Bring the entire mix to a boil and continue to simmer until the potatoes are soft. Set aside and wait for everything to cool. After cooling add cover and duct tape it in place around the entire outside of the lid. This will keep everything from accidentally spilling and running your meal. Let this entire mix come up to a boil STIRRING CONSTANTLY and that is it! This amount should feed 6 hungry ice fishermen with room to spare. Just make sure you bring bowls, spoons, a ladle and a small Ziploc bag containing extra salt (for people to individually season to taste)! While everyone is standing around enjoying the mouth watering smells of the simmering fish chowdah, I usually pull out this concoction, which is ALWAYS a crowd pleasing favorite. Using enough “acquired” Dunkin Doughnut coffee cups and lids for everyone, fill each with two heaping spoonfuls of powdered hot coco mix. To this, add enough hot water from a thermos to fill the cups half to three quarters full. Fill the remainder of the cups with Dr. McGillicuddy’s Peppermint Schnapps. Be careful, if this is not drunk fast enough, it will eventually eat through the bottom of the cup! Take care all and enjoy the final weeks of ice fishing! Thanks for the chowdah recipe. All of that looks awesome. Good for keeping a person warm out there. I must try that Chowdah recipe...and the "appetizer", both sounds yummy. Hey! Your Chow-Dah looks like the picture of a white boat I took in the snow! :) Love the duct tape reference - it is the handyman's secret weapon. The only thing more "manly" then duct tape is . . . errr . . . ok give me a minute . . . errrr . . .
BassnVT, great blog will be sure to follow.